Refrigerant gases and a compressor take heat from the air around us to provide heating/cooling and hot water. Typically for every 1KW of electricity used the Air Source Heat Pump will produce 3KW in return!.. 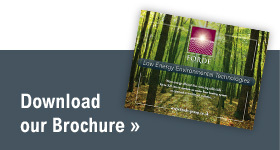 The Forde Group specialise in low-energy environmental technologies. Forde offer in-house design/consultation and installation of Underfloor Heating Systems, Air-Source Heat Pumps, Solar PVs and Floor Screeds. We work in all sectors of the construction industry including the private/self build market. We strive to be the most highly-recommended installation company of low energy environmental technological systems throughout the region. To achieve this we focus on offering a quality service coupled with strong, clear and concise design and consultation. We are creating strong long-lasting relationships with clients and suppliers old and new, built on honesty, quality and reliability. Please feel free to browse our site and we hope you find exactly the information you are looking for; however should you require further help and assistance please do not hesitate to contact us, call: 01709 761 617 or email: mail@forde-group.co.uk.